PLEASE NOTE: RSVP-ing on the FB page IS NOT the same as registering for this event. The registration link is located below. The American Civil Liberties Union of New Hampshire (ACLU of NH) is a nonprofit, nonpartisan organization dedicated to defending the individual rights of all people — no matter your gender identity, sexual orientation, socio-economic status, immigration status, or race. We The People Dare To Create A More Perfect Union. 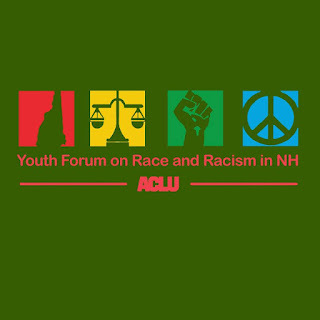 The Youth Forum on Race and Racism is interactive, youth-led, and youth-focused with a goal of developing an awareness and understanding about ways to continue changing the narrative around race and racism in New Hampshire and to achieve racial equity in our local communities statewide. At this Youth Forum, you will be challenged to analyze power structures that impede upon social equity in preparation to be effective social justice organizers and change-makers. The multiracial team of high school and college age youth and grassroots community organizers, trainers, and facilitators includes people with anti-racist and equity organizing experience. The Youth Forum is for high school juniors and seniors, community college, and four-year university students of color and white students. -How to support communities through storytelling by hearing other people's’ lived experiences and how others’ lived experiences impact you — naming the lived experiences of folks of color. -Discussing and identifying what you are understanding differently about yourself and others. -Learning about what connections are you making between storytelling and the purpose of the Youth Forum on Race and Racism in NH. -Identifying the four forms of oppression and how they connect with action(s) you are taking or looking to take in your community and across New Hampshire. -Identifying how to actionize on your newly developed (or fine-tuned) skills through engaging allies/stakeholders (and accomplices!). -Get to know your peer support networks and planning what action(s) you’ll take in your community. -Eat food with new friends that do and don’t look like you. This is a free event. The registration deadline is Thursday, October 11, 2018, and registration is required. Participants must commit to attending the entire forum. Reserve your space by completing the information below. Space is limited. We look forward to having you join us!